Whirling, chattering flocks of black birds fill the sky…. As the wet season draws to an end the late afternoon skies fill with clouds of shiny, black birds. These native birds are Metallic Starlings (also often called Glossy or Shining Starlings) and the big flocks that gather at this time of year are a combination of the successful offspring from their big breeding event that commenced over six months ago, along with the birds that migrated late last year. Most of these birds migrate down from Papua New Guinea towards the end of the dry season, usually arriving in far north Queensland in August. They are highly social, and a colony of birds (sometimes in the hundreds) will immediately start building bulky, oval nests suspended from a branch, often in large trees. The constant coming and going from a large colony is one of our most spectacular wildlife events. During the day large parties feed noisily on fruits and seeds of rainforest trees as well as nectar and insects. Around dusk they gather in tight, chattering flocks, often swirling around in a spectacular display before roosting in a large tree for the night. 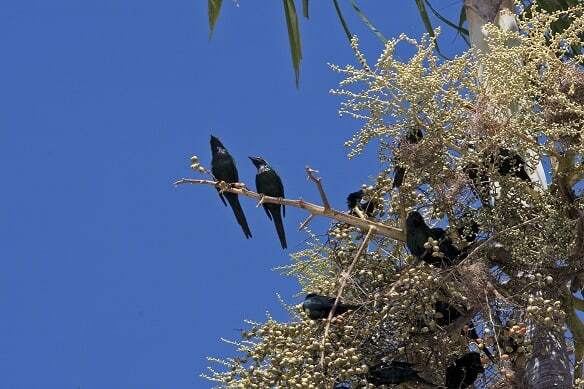 By April most have disappeared, having returned to PNG, but each year it appears more birds are overwintering in far north Queensland. They are a common bird and there is some speculation that their numbers are increasing but no study has confirmed this.